FACT: The greatest challenge that faces any newspaper is to increase advertising and readership/circulation. FACT: Newspapers face significant competition from the yellow pages for advertiser dollars. 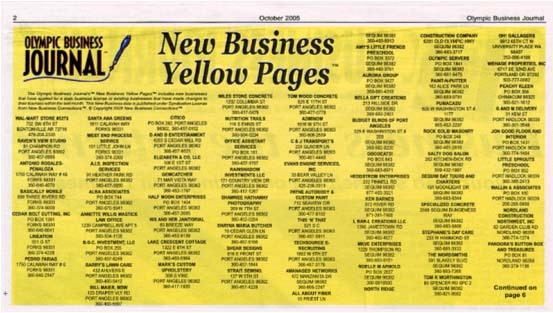 NBC Syndicates the New Business Yellow Pages™ (NBYP) to Newspapers. The NBYP directory can be Syndicated for monthly/quarterly publishing as a Features Section in a newspaper as a printed section, as seen below, or stand-alone insert. NBYP Syndication has a proven track record of raising circulation/readership and increase a paper’s advertising base. Many new consumer and business readers will be attracted to the NBYP Featured Section to see what’s new in their area. Approximately 75 (Click Here to see vendor list) different types of goods and service “vendor” businesses rely on New Business formations as a customer base. These vendor businesses are attracted to the NBYP Featured Section to advertise themselves. Additionally, the New Business data that the NBYP Licensee receives is a powerful, new source of leads to which the newspaper sales reps can sell advertising! The Syndication procedure takes approximately one week and cost far less than the new revenue the NBYP Featured Section generates. Contact NBC now for a unique, exclusive opportunity to have a profitable yellow page directory syndication that can put the competition “on its ear”.